Perhaps it is no accident that, after opening his encyclical letter "Laudato Si’" with a quote from St. Francis of Assisi’s famous Canticle of the Creatures, Pope Francis cites Pope St. John XXIII’s encyclical "Pacem in Terris" (1963) as the model for his audience of “all people” (No. 3). Shortly after "Pacem in Terris" was published, the renowned Trappist monk and author Fr. Thomas Merton wrote an article commenting on the text, stating that, “the whole climate of the encyclical [Pacem in Terris], in its love of man and of the world, and in its radiant hopefulness, is Franciscan.” Now we are privileged to witness the publication of another powerful encyclical, one that is without a doubt even more “Franciscan” and one authored by a pope named Francis! What marks this authoritative teaching as particularly “Franciscan” is more substantial than the mere references to the Saint from Assisi. Pope Francis clearly “gets” both the letter and the spirit of the Franciscan theological and spiritual tradition. From among the many Franciscan themes that arise in "Laudato Si’," at least three are worth highlighting from the outset: leaving behind “naïve romanticism,” recognizing the inherent value of all creation, and seeing the connection between abject poverty and environmental degradation. What I offer here is only a preliminary response, for the richness of this encyclical letter exceeds the limits of initial commentary. In the early section of "Laudato Si’" under the subheading “Saint Francis of Assisi,” Pope Francis calls the Christian community and those people who admire the history and legacy of St. Francis to take seriously the medieval saint’s deeply theological convictions about the relationship of the human person within and among the rest of the community of creation. 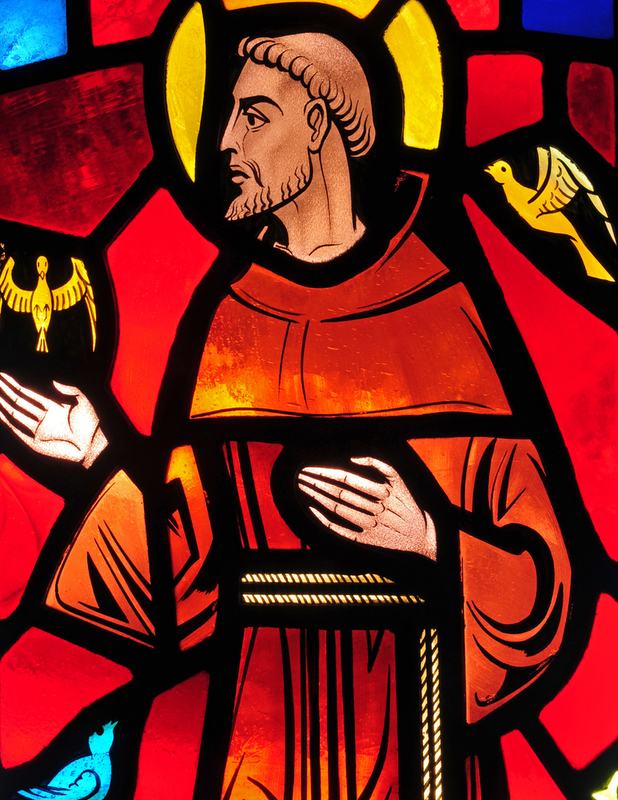 We read: “[St. Francis’s] response to the world around him was so much more than intellectual appreciation or economic calculus, for to him each and every creature was a sister united to him by bonds of affection…Such a conviction cannot be written off as naïve romanticism, for it affects the choices which determine our behavior” (No. 11). Whereas some people have viewed Francis of Assisi’s poetic Canticle of the Creatures and romantic depictions of him as a nature lover in the birdbath, Pope Francis understands that his medieval namesake recognized a profound truth of revelation: that you and I are deeply interconnected and inherently related to all else that exists. Whether we like to admit it or not, we are part of a family of creation and not kings or queens over and above nonhuman creation. Near the end of "Laudato Si’" Pope Francis exhorts us to follow the example of Francis of Assisi whose own experience of “ecological conversion” helped open his eyes to this reality. “I ask all Christians to recognize and to live fully this dimension of their conversion. May the power and the light of the grace we have received also be evident in our relationship to other creatures and to the world around us. In this way, we will help nurture that sublime fraternity with all creation which Saint Francis of Assisi so radiantly embodied” (No. 221). This vision of creation is far from one associated with the overly romantic and easily dismissible caricature of the “saint who loved animals.” Instead, it calls to mind the real complexity of Christian discipleship that extends beyond communion with God and other humans to include all of creation. Pope Francis highlights many of the ways in which nonhuman creation has been and continues to be assessed according to its instrumental value or usefulness. Arguments, Christian and secular, have been advanced in favor of conservation in order to provide for future generations. However, as Pope Francis notes at several points, “it is not enough to think of different species merely as potential ‘resources’ to be exploited, while overlooking the fact that they have value in themselves” (No. 33). Later, in a paragraph invoking the work of Teihard de Chardin, Pope Francis states that, “The ultimate purpose of other creatures is not to be found in us” (No. 83), suggesting that just as human beings have their source and goal in God, so too does the rest of creation. It is, in other words, not all about us. In addition to the respect, value, and dignity with which Francis of Assisi approached all aspects of the created order, from the smallest worm to the largest mountain, there are other Franciscan resonances present in the affirmation of the intrinsic value of all creation found in "Laudato Si'." For instance, it is the medieval Franciscan philosopher and theologian John Duns Scotus who advanced a principle of individuation (popularly referred to as haecceitas, literally meaning “this-ness” in Latin) that suggested that all aspects of the cosmos are individually loved into existence by God and their particularity is no accident or afterthought, but coextensive with their very being. Furthermore, Pope Francis relies heavily on the thought of St. Bonaventure, a Franciscan theologian and doctor of the church who affirmed the inherent dignity of all creation due to each creature being a vestigeof the creator and mirror of the Trinity. As a vestige (from the Latin Vestigio, literally meaning “footprint”), each aspect of creation bears an imprint or mark of its creator. As a mirror, all of creation reflects the Trinity. Pope Francis references this latter point when he says that, “The Franciscan saint teaches us that each creature bears in itself a specifically Trinitarian structure, so real that it could be readily contemplated if only the human gaze were not so partial, dark and fragile” (No. 239). The Holy Father calls us to follow the example of St. Bonaventure in terms of contemplation, coming to “discover God in all things” and continues, noting: “Saint Bonaventure teaches us that ‘contemplation deepens the more we feel the working of God’s grace in our hearts, and the better we learn to encounter God in creatures outside ourselves” (No. 233). One of the most striking, and seemingly controversial, dimensions of "Laudato Si’" is the explicit connection that Pope Francis makes between abject poverty and environmental degradation. The truth is that this is not a new idea, but goes back as far as Francis of Assisi, if not earlier. Pope Francis writes early on that, “The poverty and austerity of Saint Francis were no mere veneer of asceticism, but something much more radical: a refusal to turn reality into an object simply to be used and controlled” (No. 11). This statement points to the heart of St. Francis’s embrace of evangelical poverty as a means toward deepening solidarity. What the saint from Assisi recognized in his time was how not just things but also women and men began to be valued in financial terms. One’s worth came to be determined by how much money one had, rather than by the inherent value that comes with being lovingly created by God. Francis’s refusal to play by the rules of the rising merchant economy led him to embrace a voluntary poverty that allowed him to draw near to all people and, eventually, all of creation. There are numerous early legends that testify to Francis of Assisi’s continual call for the friars in particular and society in general to care for their sister and brother animals and other creatures that were often ignored or disregarded. They, like the lepers of his time or the poor and unwanted of ours, did not count according to the standard of economic valuation. Pope Francis draws our attention to the interrelationship between the reality of global climate change (largely caused by the affluent and powerful of our time) and the poor who suffer the devastating effects disproportionately. Pope Francis states: “Its worst impact will probably be felt by developing countries in coming decades” (No. 25). The category of “the marginalized” extends beyond the human species to include our very planet, or as Pope Francis says: “the earth herself, burdened and laid waste, is among the most abandoned and maltreated of our poor” (No. 2). For Francis of Assisi radical lifestyle change was required to authentically follow the Gospel. Embracing evangelical poverty as a means of protest against social injustices and a means toward closer solidarity led him among the poor and outcast of his day. Concurrently, his renunciation of the power systems of his society allowed him to—like St. Bonaventure—see God in all things and become a nature mystic. Today, we too are called to change our lives to follow the poor man of Assisi who has so inspired the present bishop of Rome to teach us with such authority and clarity rarely seen before.